Almost a month has past since the NAIS annual conference, and many of the ideas shared are still present in the back of my mind. The theme of the conference was “Think Big, Think Great,” and outgoing president Pat Bassett asked us to come up with our list of 25 factors that make schools great. His list is quite impressive, and it was hard to come up with 25 of my own. Instead, as I read each one, I began to see some commonalities among them all. Relationships: Whether the focus is on students, teachers, families, administrators or the greater community, the things that make a great school on Mr. Bassett’s list all depend on forging strong relationships. Communication: To achieve all those factors, a school needs to have excellent communication among all constituents. Values: Whatever the values are for a particular school, a school needs to be purposeful in its endeavors and have that work shaped by its values. It’s hard to come up with a list of 25, but if you click on the link above and look at Mr. Bassett’s, I think you’ll see these three things woven throughout. Maybe you’ll see more. Being a teacher means that, for the most part you spend most of your day in a classroom with students. 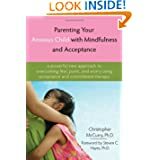 The rest of the time, you’re planning, preparing, assessing, reflecting, writing student evaluations, communicating with parents, and so on. The only real time you have to collaborate with others are the few times you meet with certain teachers at your school that happen to be on the same committee or task force, same grade-level or subject area team, or meetings that involve the entire faculty. On the rare occasion, teachers may happen to have lunch together, but it’s usually for a mere 15 minutes. If teacher’s schedules are so convoluted that they can’t meet to collaborate as often as they want in their own schools, then how can teachers network with teachers outside their own school and share some of the things they are doing? Conferences are one way. They are designed to gather like-minded professionals together in one place. Conferences, however, are expensive. Unlike some other professional conferences that may include a golf junket in the Caribbean, teacher conferences are usually held in large US cities that are easy to get to. In these lean times, though, the opportunities to attend conferences have diminished. Even at conferences, you have to work hard at meeting teachers who are passionate about the same things. For an introvert like me, meeting others is very difficult. Over the past couple of years, though, networking has become easier. First, I have to thank my school for sending me to a number of conferences these past few years. I don’t get to attend everything. My school has to say no sometimes. Perhaps it’s because I ask to go to a lot. What can I say? I love to learn. As a teacher, networking is something I’ve had to learn how to do, and it’s not easy. For good or bad, we now live in a connected world. That has made networking easier. You can interact asynchronously with others, and they don’t even have to be in the same city. Eventually you will be at a similar conference and exchange ideas face to face. I wasn’t sure what twitter was all about and decided to give it a whirl a little less than a year ago. After all, what could one learn in 140 characters. But it’s not about that. When I hit the publish button for this post, I will have also sent out a tweet. That tweet will only have the headline, but it will also include a url to this post. If you have the right twitter reader, you will automatically see a preview of this post as well. Twitter has led to a great deal of things, and I’ve managed to meet a few teachers. One of them, Kim Sivick was listed as one of 2011’s National Association of Independent School’s “Teacher of the Future.” I’m not a teacher of the future but Kim was kind enough to ask to put my blog on her blogroll at Teachers of the Future. The current post on there, titled “Conferences of the Future,” is written by Liz Davis, someone else I met (first through twitter) who is one of the organizers of the ‘unconference‘ edcampIS. It’s FREE! It’s also something that I’m really excited about helping to organize. So even if your school budgets don’t allow you to attend everything you want to go to, there are teachers who recognize the need to network beyond tweets and blogs. If you’re going to be in Seattle for the NAISAC12 conference, you can spend around $500 to hear Bill Gates speak (actually I’d do it if I could afford it), or you can come to The Northwest School a couple of days after and listen to your passionate colleagues speak for free! Already registered are Teachers, Heads of Schools, Deans, Parents, Consultants, Educational non-profits, and more. We have 11 states, D.C., and one Canadian province represented. What are you waiting for? Register now at http://www.edcampis.org – It will be a great networking opportunity! What Can a Book Do? In 2004, one of my students announced that they would not be returning to our school. His family would be moving to Italy. As a farewell gift, I gave him the book Chasing Vermeer by Blue Balliett, a children’s mystery that I thought he’d enjoy. Almost 7 years later, while visiting Seattle, they paid a visit to the school today and presented me with a different book with the same title. It was a photo book of my former student and his younger brother in front of every Vermeer painting. Inspired by the book and taking advantage of living in Europe, they planned many of their vacations around where these paintings were kept and set on a quest to see all 35 undisputed paintings (the 36th is stolen). It’s always great when former students visit and I get to find out what they’ve been up to. It’s also rather incredible to know a children’s book can inspire such an adventure. Looking through the photo book this evening and seeing a third grader grow into a tenth grader standing next to all those paintings was truly a special way to end the week. Autonomy vs. Collaboration: Are they Exclusive of Each Other? If you’ve read my blog for a while, you know that I’m a huge fan of Daniel Pink, and his book Drive. If you haven’t read it yet, I repost a great animated summary at the end of this post. Using a lot of current research, Pink makes a case for autonomy being an integral part of motivation. The other two parts: mastery, and purpose. I’m also a big fan of collaboration, and in todays world of sharing everything openly, its also really important. The summer issue of the Harvard Business Review is all about collaboration. In the book, Where Good Ideas Come From: The Natural History of Innovation by Stephen Johnson, he makes a very clear point that great individual a-ha moments are rare and that it’s often the confluence of two or more ideas that lead to game changing innovations. There’s a great quick animation of this as well (posted below). My personal answer to the question posed in the title of this post is, NO! A large percentage of our faculty just finished a summer institute at our school that was organized by our school leaders. I can truly say, that I left feeling more excited, motivated, and inspired of the potential that our school has to continue growing. If the aim was to begin cultivating a community of professional learners with growth mindsets who are both autonomous AND collaborative, the institute was an incredible success. Another underlying principle is that everything we do promotes the same kind of purpose, relevance, and collaboration for students. How was this done? By finding the strengths within each individual, yet creating a safe, trusting environment to share these. By making the purpose a clear and shared one. And by promoting mastery. It was hard work, but work everyone was so eager to do because it had meaning. It wasn’t busy work. Aside from that, the institute was run using a variety of effective models of instruction. That kind of modeling is key for inspiration and the transfer of effective teaching practices into the classroom. If you’ve read the book Switch: How to Change Things When Things are Hard by the Heath Brothers, the way to do this is to find a way to motivate both our emotional and rational minds, and set a clear path for how this will be done. I sense the beginning of purposeful changes happening at our school this year, and I couldn’t be more excited. The ending keynote at ISTE, Chris Lehman, did not focus his talk on technology,but on challenging us to dare students to do things with it. He said that technology should be like oxygen, “ubiquitous, necessary, and invisible.” In the end, it’s not about the technology, it’s about the people using it and how they use it. As Chris said, it’s about “people, people, people.” What I enjoyed about the presentation was that he was introduced by his students from the Philadelphia Science Leadership Academy poetery slam group. Chris is the founding principal of that school and writes a blog called Practical Theory (yes, another principal who blogs). I was going to write about his keynote, but if you click on his blog you can see it for yourself. Both the words of the students poetry and ‘entire’ closing keynote, where he focuses on the ethic of care, citizenship and agency, and making learning relevant to students now, can be found at Chris’ blog. If you’re interested in watching the video of the keynote, I would visit his blog and start 32:20 into the video with his students’ poetry. The final day of ISTE came fast and furious. To squeeze in more sessions, the breaks were shorter and there was no shortage of information overload. The ending keynote was given by the principal of the Philadelphia Science Leadership Academy (a public school working in partnership with the Franklin Institute), Chris Lehmann. Before he was introduced on stage, we were given three bits of advice: 1) Get it out of your brain (write about it, blog or old-style journaling), but organize and put it all somewhere; 2) Don’t wait to get started (try some of those new tools, reflect on how you’d use it with your class/school, etc. ); 3) Share! I plan to do more sharing, but for now, here are 8 things I learned today. 8) I’d love to come back to ISTE and have others from my school to share the experience. It’s in San Diego next year, which might make this more feasible. Perhaps partnerships with nearby public schools. 7) We should take no greater pleasure than seeing our students eclipse us. (Paraphrased from Lehmann’s keynote. 6) The great lie of education is to tell kids, “You might need it some day.” Make it relevant. If they need to know it now, they will be motivated to do it now. 5) I understand resources cost money, but some companies are selling devices that no smart teacher would use if they knew the much much cheaper alternatives out there. There are document cameras at our school that cost over $600 (I won’t say who this vendor was). 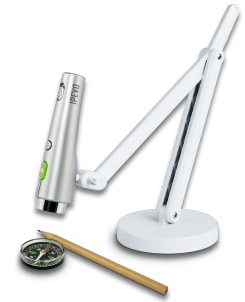 I found one for $75 from the company iPevo. Apart from no light source it’s a great simple to use document camera. The company had a booth and the people there were extremely helpful. When I asked about light source when lights are off, they offered a couple of solutions – one) a cheap desk lamp; 2) a small flashlight and some zip ties; 3) the exposure mode in the software (something new I learned). They were more about, “How can this tool help your kids,” and less about “buy this version now. It’s improved.” I know, different sales tactics, but if you start your pitch with my students, I will be more inclined to take the time to listen. 4) Jobs that are facilitated by tech are growing. Design, architecture, engineering, science, and in fact most jobs of the future will depend on the creative class (current trends, Daniel Pink, Richard Florida). Technology facilitates creativity. Those that can be replaced by tech will and should be (i.e. online math tutors in India for fractions of the cost). You cannot compete with price. This includes teachers who don’t see themselves as creative and aren’t learning when to use tech to facilitate teaching/learning. A teacher needs to matter to a student. 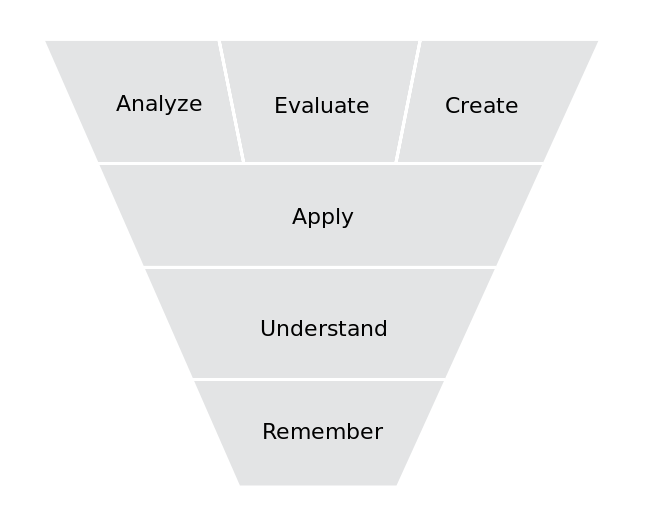 If you look at Dale’s Learning Cone from 1968 or Bloom’s Taxonomy (1956), they still hold true for how we learn and how important it is to focus as in the case of Dale’s Cone (the bottom) and in the case of Bloom’s Taxonomy (the top). With Bloom’s you cannot do the top if you don’t have the skills below it. 1) Don’t give your kids the answers. Let them grapple with it, predict, apply, be resourceful. A good metaphor was the horror movie: If there is a real intense scene and someone tells you, “don’t worry, the cops will arrive just in the nick of time,” that experience is lost. 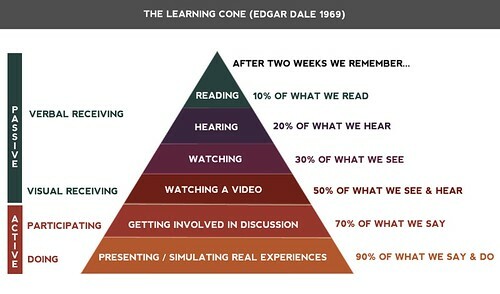 That is the same for kids’ learning. If you TELL them rather than let them DISCOVER it, you have just spoiled their learning experience/opportunity. What an incredible 3.5 days! I have never before been this overloaded with information. Still the bottom line is this: No matter how much tech is out there. No matter how extensive your PLN is, you have to remember it’s all about relationships. The response you received from a question you tweeted didn’t come from a google algorithm. It came from an actual person. What a great experience to have met some of the actual people in my extended PLN. It’d be great to find educators public and independent elementary teachers who tweet locally. I’ll leave you with this: I am smart. My colleagues, students, parents of students, are collectively much smarter. My PLN is brilliant! I will continue to share bits and pieces review the resources I’ve learned about and talk about a great book I’m almost through called The New Culture of Learning: Cultivating the Imagination for a World in Constant Change by John Seely Brown. 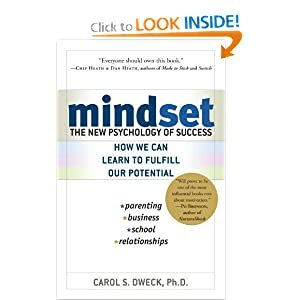 The independent school group at ISTE has chosen this book as a summer book club book, and they’ve got the author to agree to a web chat sometime between mid-August and early September depending on the author’s schedule. I’m more than half-way through. It’s quick easy and thought provoking. If you’re a twitter user, Vinnie Vrotney will be hosting an #isedchat on July 21st. More details to follow. If you’re interested on Chris Lehmann’s talk, you can get an idea of his philosophy through his TEDxPhilly talk.